Is beef jerky good for you? | Bigwig Jerky Co.
Home » News » Is beef jerky good for you? Do you like beef jerky? Many people are having a debate whether is beef jerky healthy or not. While some claim that it is full of fat and salt, the others recommend it as a high-energy snack that is a part of every healthy lifestyle and diet. In this article we are going to talk about what caused these comments, while we explain the benefits, but also the drawbacks of this delicious snack. Is beef jerky good for you? Let’s find out. We are quite certain that at least once you had your interaction with the jerky of any kind. These air-dried pieces of meat, supplied with a lot of salt and some additives in order to make it last longer are often found in the butcheries, delicates departments of the super markets, but occasionally you can find them in the health food stores. However, we believe that they are supplied with less additives and salt, if you search them in the health food stores. Below we will see the nutritional composition of the beef jerky, which can determine why it is good, or on the other side not good for you. Although optimal amounts of fat in your body are required to reduce inflammations and maintain a healthy lifestyle, too much of a stored, saturated fat can lead to serious health problems, including severe, life-threatening heart diseases. Half of one portions calories are coming from around 7.3 grams of total fat. It is important to keep in mind that 3 grams out of those 7.3 grams contain the saturated fat. If you want to maintain a healthy lifestyle, the experts recommend to reduce the saturated fat intake on daily basis. The most heart-healthy fats can be found in the vegetable oils and seafood, so consider replacing the saturated fat foot with the mounsaturated fats. Protein inside the beef jerky is very important and essential for the proper functioning of our metabolism. Around 30 grams of beef jerky contain 9,4 grams of protein. According to the reliable scientific sources, it is recommended to take between 45 and 50 grams of protein to females, and up to 55 grams of protein for males per day. Basically, as a result of protein, our body builds the necessary enzymes that contribute to the proper functioning of all organ systems in our body. Another function of proteins in our body, aside from creating amino-acids is that thanks to the iron supplementation, create the red blood-cells and prevent conditions such as anemia. The containment of protein in the beef jerky is probably the most important reason why you should eat it. Beef jerky also contains zinc, which is, aside from the iron the most important mineral that we should take. The daily recommended dose of zinc is up to 40 milligrams. Zinc is important because it improves the functionality of our immune system, this way it prevents us from getting ill, or sore in general. It also supports the process of cell division. It doesn’t hurt to mention that the use of zinc will also heal your wounds in a timely manner in case you get wounded. There are many benefits of the zinc-rich food, that we should definitely not ignore. Around 30 grams of beef jerky contain 590 milligrams of sodium. The increased amounts of sodium can lead to various health problems. Aside from the fluid retention, it can cause a great variety of heart problems, including the oscillations in blood pressure. Various health institutes are trying to reduce the overall daily sodium intake, and they are limiting it to 2,300 milligrams per day. In case you suffer from high blood pressure, diabetes, or other conditions that can seriously jeopardize your health state, it is recommended to avoid the sodium-rich foods. Beef jerky is full of different spices, hot sauce, rubbings, and additional flavorings which increase its’ durability and preserve it. However, there are many used flavorings which increase the concentration of carbohydrate content. An optimal amount of carbohydrates is recommended on a daily basis, to make your body less fatigued and more energized. However, don’t push the limits. Finding a beef jerky with the least possible amounts of saturated fat is like counting the grains of sand. However, it won’t hurt you to research the brands that will use the least salt and saturated fats. If you want to consume less of the saturated fat, search for the smaller strips of meat, which often result lower in saturated fat, as they are thinner. Also, you can always make your own beef jerky at home. Springing for this method, allows you to control the amounts of salt, and other flavorings put in the meat. 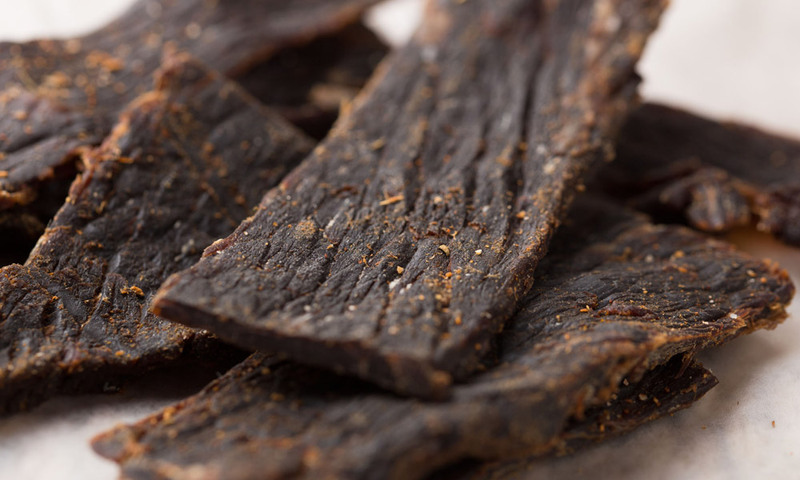 If you have a food dehydrator at home, you can use it to easily make delicious and healthy beef jerky. So, is beef jerky healthy? Natural, grass-fed beef contains the fat acids that can help you increase the durability and overall health of your brain. Packed with protein, and lower in saturated fat, beef jerky can help you maintain your figure, by using it as a high-protein, energizing fat after a workout. As long as you avoid the strips full of sodium and saturated fat, you are good to go. In reality, just like every food that we consume, we shouldn’t overeat ourselves, because the extended periods of eating the same food are never good for our metabolism and lifestyle. Keep your beef jerky intake optimal, and its’ healthy benefits will reflect on you.